You will find Stonington Vineyards in the Stonington Uplands above the Connecticut Coast where the Long Island Sound meets the open Atlantic. I have been buying wine from them for many years. They have been producing award-winning European-style wines for 17 years, not far from Mystic Seaport. One of their best selling wines is Seaport White. I am not the least bit sorry to say, that for years I dismissed it as just another inexpensive white blend ($8 or so). An amusing wine for the unwashed masses. But I am ordering one large dish of crow…or seagull, as may be more appropriate. Always among Stonington’s more popular offerings, Seaport White is a wonderful summer sipping wine. Served chilled, or heaven forbid, even with an ice-cube when the weather insists, this is a wonderful sipping wine, and this summer, when entertaining, we’ve served it numerous times to raves. The most recent offering even comes with a slight sparkle. This off-dry Vidal/Chardonnay blend made by winemaker Mike McAndrew is a wonderful little wine, that could easily be mistaken for the best of Languedoc, or a Australian or New Zealand sauvignon blanc. And it stands up to them beautifully. A smashing summer wine for sipping with fun conversation, or with fish or chicken or salads or roasted vegetables. It even might make a large plate of crow taste good. Drink up and enjoy the conversation. There are many good chardonnays throughout the east coast. And how experts, especially like Matt Kramer, James Laube, and Robert Parker, among many, taste so many and are able to distinguish among them all is a mystery to me, though I have the up-most respect for the, for I know they can and that their talents are true and supreme. But the one thing I am truly grateful for about the east coast is that it offers so much variety. However, that said, one wonderful chardonnay you need try is Sharpe Hill Vineyard American Chardonnay. Dominique and I just served it to family at a mid-summer get together, and it was incredible. It had lots of fresh fruit up front, especially citrus. This barrel fermented chardonnay was smooth and dry, and with a touch of toasted oak and vanilla. Just beautiful. And the 2001 was only $12.99...a steal at that price, especially considering there are so many much pricier versions on both coasts. This chardonnay has won more than 39 medals, including three gold in the last 4 ½ years, and countless other awards, at competitions like the Tasters‘ Guild. The American Chardonnay has received 39 medals from events such as the San Diego International Wine Judging; International Eastern Wine Competition; the L.A. County Fair, and many more. Sharpe Hill Vineyard is one of the better east coast wineries, and has received over 140 medals in international tastings overall, and is located in the town of Pomfret -just minutes from scenic Route 169 and from the Putnam Antiques District. Search their wines out…and enjoy. My brother-in-law Michael, and his wife Jill, live in Maine with their three Golden Retreivers. And over the years, we have gone up to visit them. A few trips in summer, a Christmas or two. We've taken in a Seadogs game, bought antiques, shopped in Portland and L.L. bean's, and taken a boat ride up the Kennebec River. And of course, when we're up there, or when they are coming down, I always satisfy my fix for Maine wines, some of which are very good. The most notable winery, to me, was also the first. 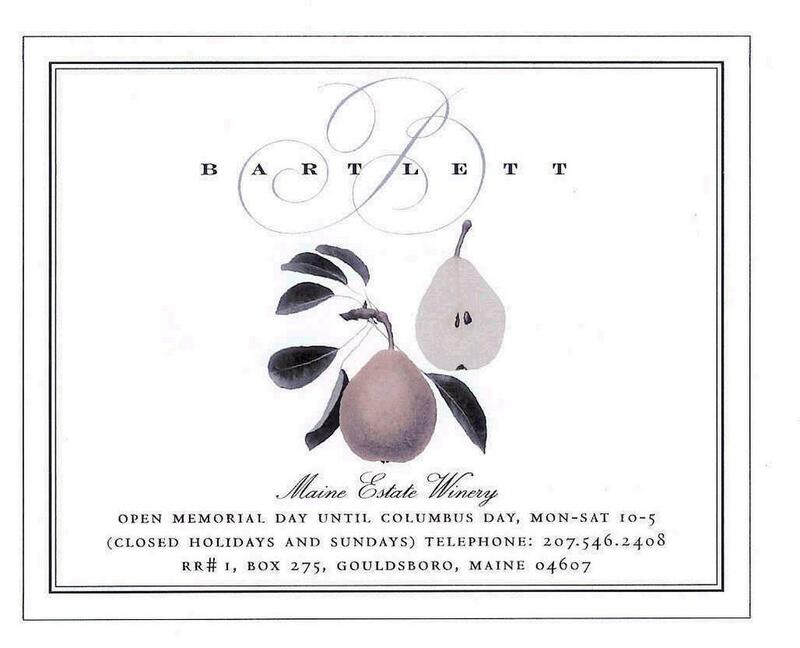 Founded by Robert and Kathe Bartlett in 1982 Bartlett Maine Estate Winery was Maine's first winery. Nestled in a quiet wooded setting enhanced by gardens, the tasting room allows for a relaxed appreciation of the many internationally recognized wines produced here from Maine grown fruits. The Bartlett's make some excellent wines. The other night, I pulled out a bottle of Pear Dry, an exceptional, lemony white wine, with great fruit flavors, but not sweet at all. Slightly oaked, it is very much like an exquisite sauveignon blanc. It is a shock every time we serve it to newcomers. Even the biggest wine snobs are always impressed by this wine. Because of Maine's harsh climate, grapes are hard to grow. The Bartletts decided to make fruit wines, and they are the premiere maker of such wines...no matter where you are. And the packaging is incredible. 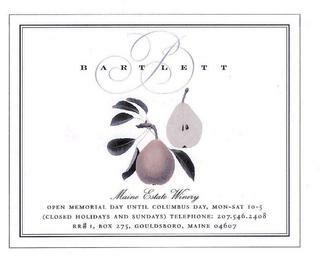 "The Bartlett bottles are adorned with unique labels depicting old Victorian era designs of fruit and flowers. This smart packaging contributes to the overall air of sophistication surrounding the wines," wrote Abagail Ingalls in the June, 2005 issue of Beverage Magazine. That's why they make great gifts, especially around the holidays...it shows good taste in so many ways. "The Bartlett wines go wonderfully with food. Some popular pairings are: Oak Dry Blueberry with assorted cheeses and herb-crusted lamb," Ingalls wrote. "The French Oak Pear pairs very well with pork tenderloin and parsnips or a beet and walnut salad with baby spinach and dried cranberries." I have always thought that if the Bartletts made the same wines but were located on Long Island or in the Finger Lakes, their brand would be a much higher profile product. Ah, well. Now that the interstate shipping laws are starting to come down, this is one of the wineries we hope makes huge strides....because the quality is incredible. 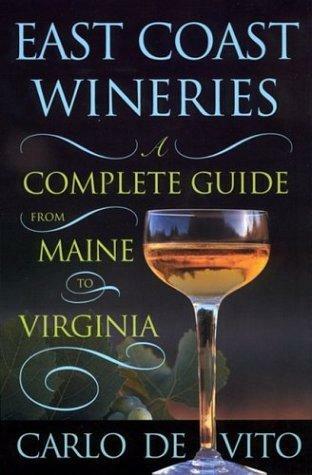 The wines can be found in some of the better wine shops throughout Maine (we've had luck finding them in downtown Portland shops)and of course at the winery in Gouldsboro. Try the Pear Dry and the Blueberry Dry, as well as many of their other wonderful dessert wines. This is a wonderful winery! 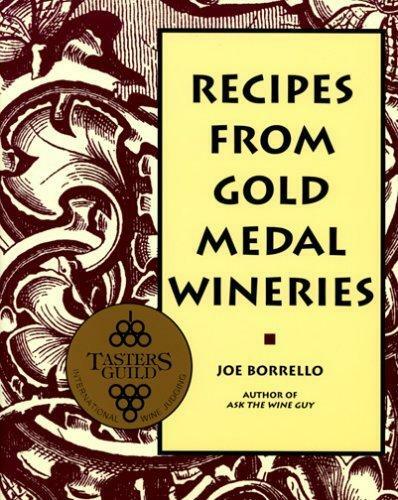 RECIPES FROM GOLD MEDAL WINERIES by Joe Borello, who is also the author of Ask the Wine Guy, is a wonderful new book on cooking with wine. Joe Borrello is the Executive Director of Tasters Guild International. He frequently travels the globe leading winery tours, conducting cooking seminars, and judging in international comeptitions. Founded in 1987, Tasters Guild International is a food and wine appreciation society dedicated to the enjoyment and responsible use of wine. Each year, Tasters Guild conducts an international wine judging with entries from wineries around the globe. 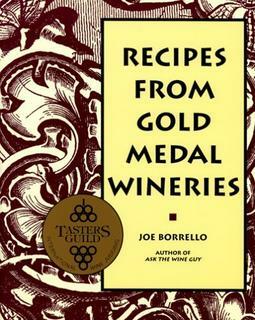 Gold Medal-winning wineries have provided author Joe Borrello with some of their most delicious recipes. 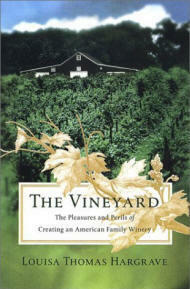 Using their award winning wines as an ingriedient, over 150 recipes from 60 wineries can be found in the book. Some are easy to prepare and some are more compicated. It includes apetizers, desserts, meat, fish and vegatable dishes. It's great for small elegant meals as well as a great source for dishes that will impress both family and friends. A great entertaining tool and a secret weapon for the holidays. Borello does an excellent job collecting a wide variety of recipes. Delectable dishes include Salmon with Prosecco-Caper Sauce, Pumpkin Risotto, Pork Filet Mignon with Port Wine Sauce,Plum and Pinot Gris Sorbet, Pear Infused Pear Cake, and many, many more fun recipes. We love this book. Go and find it, and have a nice glass of wine with an excellent dish of food. Enjoy! Recently, my sister Claudia came down from Massachusetts with her two children, and my other sister Leigh also joined us. Along with my wife and children, all of us spent a glorious day at Avon-By-The-Sea, New Jersey. The sun was a beautiful periwinkle blue, and the water was a light green, and very clear, and the waves were brutal and fun. We body surfed, boogie-boarded, ate French fries and walked the boardwalk. A marvelous day. For dinner, we went to a little restaurant called Bella Cucina, in Freehold. Luella, the owner, made us a dish to start off with that comes from a small town north of Naples. She cut pizza dough into small triangles, and fried the dough, and then placed the pieces, still hot, in a large bowl, and then covered it, not too heavily, with diced tomatoes, onions, basil, olive oil, vinegar, salt and pepper. We tossed it like a salad and ate it like it was going out of style. 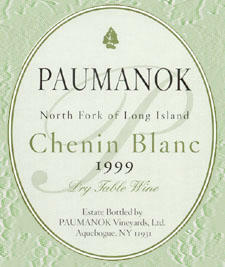 And we washed it down with a wonderful, lemony white wine from Paumanok Vineyards. Their Chenin Blanc 2001 is fantastic. But don’t just take my word for it…see what the professionals have to say about this wine. No matter what, no matter the time of year, whether it’s oysters, clams, or any other kind of shellfish, raw or cooked, or with light salads or soups, this Chenin Blanc is incredible, whether your drinking wine from the east coast, California, Europe, or anywhere else. You’re missing something if you’re not tasting this. The other night my wife decided we would have a wonderful summer meal. We had fresh corn and Jersey tomatoes right off a small farm 5 miles down the road from us. I love the farm, whose name I am not aware of, but which is on Route 33, between Freehold and the Jersey Shore. It is stocked with a turkey, geese, chickens, roosters, ducks, and other odd assorted animals. It is not the prettiest, most commercial place. The vegetables and fresh flowers are left on large tables, and they rely on honesty as you put your money in the slot. We fed our boys first, and let them watch a movie in the den. My wife, Dominique, and I had a date. It was grown-up’s night out….we ate our dinner on the deck. We put a cloth tablecloth on the back table, candles, and real napkins. She served a salad of fresh, cut tomatoes, onions, and oil and vinegar. And with it she offered fresh picked corn on the cob, steaming from the burner on the grill. And my contribution was that I grilled two medium-rare small steaks. A little salt and pepper and we popped the cork. 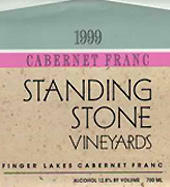 I opened a 1999 Standing Stone Vineyards Cabernet Franc. This is a light-to-medium bodied red. An old-fashioned claret, if you will. Lot’s of bright red fruits up front – raspberry and cherry. But as it lingered, softer, more mature fruits came through. And it finished nice and dry. Standing Stone is one of the premiere makers of Gewurztraminer and Riesling in the country, but their reds are wonderful too. The Cabernet Franc was pressed and finished fermenting in American Oak Barrels. The wine was aged for 10 months in a combination of French and American oak barrels, and then blended in late spring with some Merlot for a little more mouthfeel. The 1999 Cabernet Franc is no longer available, but the new 2002 Cabernet Franc is excellent, too. They only made 221 cases, so you better buy it when you see it….you can drink it right away, or you can save it too. But what you really want to do, no matter when, is drink it. For two summers, my family and I have rented a house for a week in Narragansett, Rhode Island, not far from Newport. These have been some of my favorite moments in life. The house is on the water and the bright blue sky pierces the eye. The vibrant green lawn stretches out to the dark navy ocean, and the sea breeze fills your nose and lungs with fresh summer air. There are several wonderful wineries in the area. One of my favorites is Greenvale Vineyards. A beautiful New England experience, I’m not sure what’s more exciting…visiting the grounds with the age-old, well preserved Victorian house or tasting the wine in the old converted barn. This year we didn’t get a chance to stay in Rhode Island. But recently, my wife made a giant haul of mussels with garlic, onions, and chopped fresh tomatoes. And with it we opened a fabulous 2001 Greenvale Vineyards Chardonnay. I like this chardonnay very much. Half the chardonnay is finished in stainless steel and the other half is finished in oak barrels. Fabulous fruity aromas, and a beautiful, full, smooth, dry finish. A wonderful wine. So we ate the mussels, dipped some baguette into the broth, and sipped the fabulous chardonnay that connected it all in a tremendous way. I closed my eyes, and I was back in Rhode Island. Open up a bottle of summer vacation - try a bottle of Greenvale Vineyards chardonnay as soon as possible. Blue Mountain Vineyards is one of Dominique and mine's favorite wineries in Pennsylvania. Joe and Vicky are the nicest poeple, and will answer all your questions with a friendly and open style, whether you're a novice or an expert. The 2002 Merlot had a yummy nose, filled with cherry, plum, and yes, some vanilla, as advertised. The cherries and plum both come through on the palate with a smooth finish. Not the bite I prefer, but the style here is mellow and very drinkable. One of the better red winemakers on the east coast. 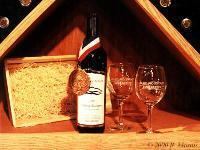 The 2001 Merlot won Bronze at the 2004 Pacific Rim International Wine Competition. The Blue Heron is also very nice. But that's another review. Without question, Maryland has several very fine wineries. Among them is Basignani Winery, a small family owned business, where even the wines are named after family members. Last night, Dominique and I went to the cellar, and pulled out a wonderful wine from Basignani. A medium bodied red for a cool summer's evening. At a small restuarant called Bella Cucina, I enjoyed mine with an eggplant rollitini served with marsala sauce. The dish was exquisite and the wine was a superb cmpanion. It is a blend of cabernet sauvignon, cabernet franc and merlot. One can taste cherries and slightly darker fruits, like blackberry and dark cherry as well. It has nice tannins and a puckerish ending. A lovely wine to go with food. Basignani Winery's 1999 Lorenzino Reserve was the 2003 Maryland Governor's Cup Winner, meaning it was best in show. It also recently took home a Bronze medal from the 2005 Los Angeles County Fair. And the Washingtonian magazine called the 1998 Lorenzino Reserve "impressive." It's a winner from one of our favorite red wine makers on the east coast. 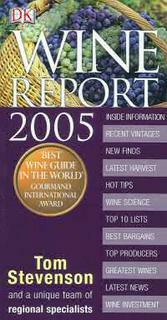 "The Wine Report 2005 has named Dr. Konstanin Frank Vinifera Wine Cellars as the Greatest Wine Producer in the Atlantic Northeast, helping to boost New York’s reputation in the world’s highly competitive winemaking industry. With competition being fiercer than ever, New York wineries have steadily been climbing the ladder to national and international acclaim. Consistently at the front of the pack, Dr. Frank’s has once again proven that New York wineries can compete with the best, as evidenced by their winning 32 gold medals in national and international wine competitions in 2004. In addition, Dr. Frank's is the only representative from the Finger Lakes region to make the Top 10. Located on Keuka Lake a few miles north of Hammondsport, Dr. Frank’s has long been associated with the New York wine revolution. Its founder, Dr. Konstantin Frank, was the first to cultivate the European vitis vinifera grapevines in the eastern United States, the varieties used in virtually all of the world’s finest wines." See the rest of the list above. Congratulations to all those who made it! Unionville Vineyards, 2002 Cabernet Sauvignon, Reserve won a Gold Medal in the Cabernet Vintage 2002, at the 2005 Jerry D. Mead's New World International Wine Compeititon which was held in Ontario, California on February 20 and 21st. Jerry Mead's event was founded in 1990 Jerry D. Mead's New World International Wine Competition was established in 1990. Mead was a well known and syndicated wine columnist, as well as a publisher, and wine consultant. According to the organizers, "It was his desire to establish a wine competition that, for the first time in America and perhaps the world, to pit the best wines from each price class against each other resulting in a Best of Variety award." Unionville beat out such names as Trinchero, Gundlach Bundschu, and Kendall-Jackson. According to Unionville, the wine also won a Silver medal at the 2005 Grand Harvest Awards and a Bronze medal at the 2005 Finger Lakes International Wine Competition.Unionville has always been known for their whites, especially their reisling, but lately they've been making great strides in reds. In the last two years alone, they've won seven gold medals, and countless siver and bronze. Now, I know we're little late in reporting this gold medal. However the news was just enough to make me curious to buy a bottle and try it...but we hadn't gotten around to actually tasting it until now. My wife Dominique and I uncorked a bottle the other night. The 2002 Reserve has lot's of blackberry, plum, and dark chocolate that come through. Also cassis, and nice tannins to even it all out. This is a very nice surprise from one of New Jersey's best wineries. There is little doubt that Jamesport Vineyards produces one of the best dessert wines on the east coast. Baked apple, pear juice, vanilla, butterscotch, and honey all come through. Super sweet and viscous, it has a wonderful acidity that brings it to an incredible crescendo. But don't just take my word for it. Howard Goldberg of the New York Times wrote, "My favorite is the voluptuous 2001 late-harvest riesling." It won a Silver Medal at the International Eastern Wine Competition, a Gold Medal at the 2003 NYW&FC, Double Gold Medal at 2002 NYSW&FC, and it scored 90 Points at Wine Spectator. So many winemakers end up scribbling some kind of tome, and many are mostly self congratulating bumper stickers for their careers. I did this...I did that...I was right. They are written by ghosts who have no real sense of the wine world and often fail to bring across the charm and difficulties of vineyard life. Louisa Hargrave's book The Vineyard is not one of those above mentioned snores. Ms. Hargrave tells of the hardscrable life of a pioneer vineyard owner, which brings across the struggles of everyday farming, bringing up a family, and growing a vineyard business. She and her husband Alex founded Hargrave Vineyards the first winery on Long Island. There are mistakes a plenty, and Hargrave handles it with a great sense of humor and a wonderful sense of grace. For all those who harbor dreams of owning a vineyard, or wonder what owning a vineyard must be like, Ms. Hrgrave's heartfelt memoir recounts her failures, her triumphs, and her troubles. She is an uber mom, raising children and tending vines, year after year. And Ms. Hargrave details the winery's eventual triumph, as well as detailing the painful, emotional split with her husband. She is as funny as she is charming...on the page as she is in real life. A fascinating, eloquent, and intimate prtrait of vineyard life. I have an admission. I am both a fan and a friend of Matt Kramer. As his former editor while I was at Running Press, it was my great honor to work with Matt on his wonderful books. Since I no longer edit his books, I feel free, with the previous admission that I can tell you what I really think. Firstly, Matt, in my estimation, is the the most literate and best living wine writer working today. Everyone one of his books is a pleasure and a treat to read. Secondly, if you enjoy reading books about wine, and you don't have Making Sense of Wine in your wine library, you are missing out. This is simply the most important single book on wine, dispelling myths and making learning about wine as fun as drinking it. 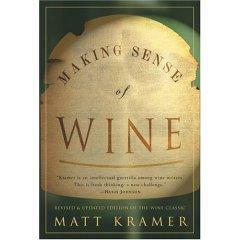 Read his columns in the New York Sun and the Wine Spectator, and read Making Sense of Wine....it is an excellent book. I have long liked Sherwood House Vineyards. In the past Dr. Charles Smithen and his wife Barabara's wines have been difficult to find. But they are more than worth the effort. On our recent trip to Long Island Dominique and I had the opportunity to sample their two most recent bottlings. Admittedly, I prefer the puckerish steely chardonnays over those legion of their more crafted mellower bretheren. But from time to time the oakier versions strike home. Sherwood House Vineyards Chardonnay 2001 is an excellent wine. Rich, smooth, mellow, with nice fruit up front and an excellent creamy but light finish make it an exceptional chardonnay....certainly one of our favorites on the entire east coast....a chardonnay that can stand up to any made here in the States. We've served this particular chardonnay to fanciers of Patz & Hall, Hanzell, and Kistler, and come away with favorable reviews. An excellent achievement. The Merlot was no slouch either. With a nice mix of fruit that held both fresh cherries and blackberry and some darker fruits, this dry red is a medium bodied red with lots of flavor and nice tannins to even out all that fruit. Very nice! You can find the wines at the Tasting Room on the North Shore, at Vintage New York in the city, or at another fine retailer near you. Congratulations to those over at Sherwood House Vineyards! When Dominique and I were in Long Island recently, we met some wonderful folks. 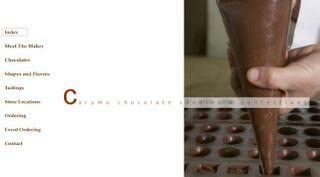 Most notably we met a burgeoning chocolatier named Cary M. Becraft, and her husband Peter. Cary's choclates are exceptional. Dominique is a lover of fine chocolates, and in the past I have bought many chocolates for her. But Cary's confections were unique. She offers unique blends and matches one might not think up. They tend to be fairly sophisticated. If you like sweet chocolate, this isn't for you. Cary makes, deep, rich chocolates of all kinds, but her final product doesn't reek of sugar and wax. This is cocoa...and lots of it. It's not inexpensive...but it's all handmade...and excellent. You can find her chocolates at Vintage New York, where I first found them. Make the effort to find this chocolate, and treat yourself to some. You won't regret it. Keep an eye out for him in the NY Times. Always a treat. 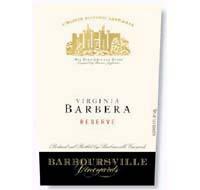 One of the most pleasant discoveries of our wine travels in the last three or four years was Barboursville Vineyards, in Virginia. They make a number of wonderful wines. And since first fnding them, their product has grown better and better. Dominique and I consider their Barbera one of the best red wines of the entire east coast, and this newest edition of one of their signature reserve wines is incredible. Dark cherries and blackberry. Plummy, smooth, and with just enough tannin to make your mouth pucker at the end.. Excellent!! "Adds to the burgeoning reputation of wines from the Atlantic side." "This book is the most comprehensive guide now available"
"DeVito's book is an excellent reference and tour guide." "East coast wineries get their due...."
Hello Mother, Hello Father....Wine Camp!!! For our tenth year wedding anniversary, I told my wife we would do whatever she wanted to celebrate the event. With the entire world at her disposal, she told me she wanted us to go to Long Island, to something called Wine Camp. I have dragged my wife Dominique all around the world to see wineries. From up and down the east coast to California, Canada, France, Spain and Chile. I said to her, "10 years from now, are you going to complain? I mean when people asked what we did for our anniversary, are you going to be happy telling them we went to Long Island?" She said yes. So we went to wine camp. It was a three night, four day camp, that runs the tag line, "Finally, a camp for adults!" It is organized by the Long Island Wine Country Bed & Breakfast Group, a small group of charming inns from the region. I had been on countless vinyard and winery tours, and I was somehwat skeptical about the camp, but I agreed that this would be it. Afterall, it's a passion of mine to begin with. The program includes many of the region's award winning wineries:Bedell Cellars, Castello di Borghese, Corey Creek Vineyards, The Lenz Winery, Peconic Bay, The Old Field Vineyards, Paumanok Vineyards, and The Tasting Room. The tour began with the requisite tasting instructions and explainations that seem a part of every wine tour. But it's for the intermediate wine lover as well. In our midst was a man who was studying for a Masters In Wine. Eventually we met many of the wine makers and owners. Most impressive were Eric Frey, of Lenz, Stan Schumacher of Castello di Borghese, and Greg Gove of Peconic Bay Winery. All were wonderful and entertaining. We blended wine, planted vines, ate fantastic food, and drank some wonderful wine. The camp's tag line is an undersell - it should read - "It's the most fun you can have with your clothes on!" It's a great bargin (especially considering you get one free case of assorted wine per couple), and you'll be shocked, and pleased. Call now...it's too fun to pass up if you like wine. And make sure you bring your credit card...because you'll want to bring home more wine than they give you.